HP LaserJet P1102W Monochrome Wireless WiFi Laser Printer Pagecount Only 888! 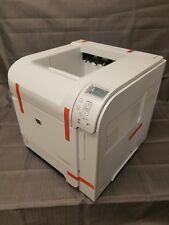 HP LASERJET P4015N CB509A PRINTER RE-MANUFACTURED REFURBISHED 120 DAY WARRANTY! ALL INTERNAL PARTS ARE NEW. REASONS YOU MAY CONSIDER MIDWEST DYNAMICS TO HELP YOU WITH YOUR PRINTER NEEDS 7: OVER 20 YEARS IN THE IMAGING INDUSTRY WITH OVER 150 YEARS OF COMBINED PRINTER EXPERIENCE BETWEEN ALL OF OUR EXPERT EMPLOYEES. ALL INTERNAL PARTS ARE NEW. 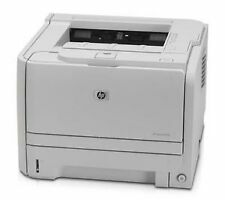 HP LaserJet P1102W Monochrome Wireless WiFi Laser Printer Pagecount Only 888!! HP LaserJet P1102W printer in excellent working condition. Printer shows no imperfections and has only 888!!! pages printed. Printer comes with power cable, usb cable and the used original genuine HP 85A toner cartridge. 4.5 out of 5 stars - HP LaserJet P1102W Monochrome Wireless WiFi Laser Printer Pagecount Only 888! 215 product ratings215 product ratings - HP LaserJet P1102W Monochrome Wireless WiFi Laser Printer Pagecount Only 888! ALL INTERNAL PARTS ARE INSPECTED AND REPLACED AS NECESSARY. SMOOTH RUNNING AND PRINTS CRISP DARK PAGES AS IT SHOULD. ANY PANELS THAT WERE YELLOWED HAVE BEEN PAINTED TO MATCH THE FACTORY COLORS. SOLENOIDS ARE REPLACED. Toner is empty. Drum has printed 95 pages. 100% remaining. Upon receiving your inquiry, I’m sure we can work out any issues amicably. Under theSelect a topic prompt Choose ONLY the following selection…. Yellow 100%. All warranties on new products are covered by the original manufacturer's policies. This includes PRAM or BIOS batteries on computers, laptop batteries, phone batteries, or any other type of battery. 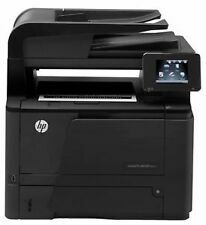 HP Color LaserJet CP1025nw. The built-in wireless Ethernet network in this HP Workgroup Laser Printer lets you print directly from multiple computers in your office. Page Yield Laser Toner. Product Type. 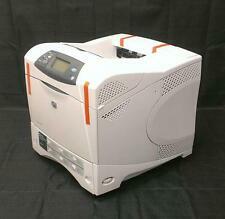 Used HP LaserJet Pro 400 M451dn Color Printer. Includes toner. Includes power plug. 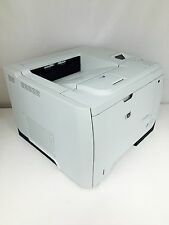 Model: LaserJet Pro MFP M130fn. All-In-One:" Printer, Copy, Scan & Fax. Printing Technology: Laser. Manufacturer: HP. Print Speed: Up To 23 ppm. Maximum Print Resolution: Up To 600 x 600dpi. 431 N Wright Brothers Drive. THIS MODEL HAS BUILT IN DUPLEXER FOR AUTOMATIC 2-SIDED PRINT JOBS AS WELL AS USB (VERSION 2.0) AND FAST ETHERNET NETWORK FOR EASY CONNECTIVITY. IT IS WINDOWS 7, WINDOWS 8 AND WINDOWS 10 READY. IT IS MAC AND PC COMPATIBLE. Trending at $97.45eBay determines this price through a machine learned model of the product's sale prices within the last 90 days. Printer is in very good used condition. Tested and prints as it should. Power cord is included. $Just arrived and in really nice shape this off lease Hp LaserJet M601N printer. This printer arrived with a nice low page count and is in nice shape overall. The page count is 73,709 pages. Our technicians have thoroughly tested this printer to make certain that it is operating properly. In addition they have installed new pickup and feed rollers to ensure trouble free printing. Your new printer will ship with a power cord and a partial toner too! After testing your printer will be wiped down, poly bagged and foam packed in a heavy carton! We do not have the owners manual or drivers on CD however the drivers can be downloaded from hp We have our own Hp printer technicians on staff to help you before and after the sale!. Used, Minor Signs of Wear from Previous Use. 5427 Page Count, Used Toner . Power Cord, USB Cable, Used Toner. Everything included in this ad is shown in the pictures unless otherwise stated. We will help to resolve any issues quickly and fairly. Model: CP2025dn. Testing: tested with test prints. No further testing has been conducted. Sold as is. Trending at $101.78eBay determines this price through a machine learned model of the product's sale prices within the last 90 days. 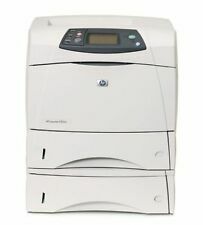 HP LASERJET 4000N Laser PRINTER. Under theSelect a topic prompt Choose ONLY the following selection…. FREE LOCAL PICK-UP. Trending at $189.00eBay determines this price through a machine learned model of the product's sale prices within the last 90 days. 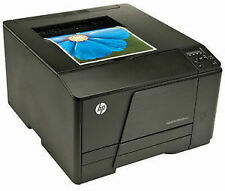 1x HP Color LaserJet Pro MFP M476nw Printer. Duplex: Yes. The device has been factory reset. Printer Type: All-in-One, Wireless. Toner Usage Technology: Laser. Output Type: Color. By reusing instead of recycling electronics, our team transforms e-waste into opportunities to promote digital inclusion and digital access. 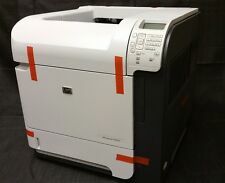 This HP LaserJet Pro P1606dn is in great working condition. The printer does have minor cosmetic defects, small scuffs and scratches. Please photos for condition. The toner is almost out at less than 10% left in the cartridge. Other than the toner being almost out, this is a fully functioning printer. This listing includes the Printer and Power cable only. No accessories or software is included. Thanks for viewing! HP LaserJet Pro P1606dn Monochrome Printer - Page Count: 19,016 with 10% Toner. Condition is Used. Shipped with FedEx Ground or FedEx Home Delivery.